Beverly Hills: Sunday, October 18, 2015, 6:30 p.m.
Redondo Beach: Monday, October 19, 2015, 8:00 p.m. Thousand Oaks: Tuesday, October 20, 2015, 8:00 p.m.
Pasadena: Wednesday, October 21, 2015, 8:00 p.m.
Ehud Barak is one of the most recognizable names in Israeli politics, a man “ who over a half-century career became Israel’s most decorated soldier and held the nation’s trifecta of top positions, ” according to the New York Times. Mr. Barak has served Israel as Prime Minister, Chief of General Staff of the Israeli Defense Forces and most recently as Minister of Defense, a position he took on in 2007. As Israel’s 10th Prime Minister, Ehud Barak led the country out of prolonged recession and into an economic boom, with 5.9% annual growth, record foreign investments, near zero inflation, a halved deficit and significantly decreased external debt. ending 18 tragic and bloody years of Israel’s presence there. He led far-reaching efforts to negotiate peace agreements, first with Syria and later with the Palestinian authority, with the active participation of President Bill Clinton and his administration. Regrettably, these negotiations did not result in the breakthroughs necessary to conclude final agreements. Before being elected Prime Minister, Mr. Barak completed an illustrious 36-year career in the Israeli Defense Forces as the most decorated soldier in its history. He was a key architect of the June 1976 Entebbe Operation for the rescue of passengers on the Air Franceaircraft hijacked by terrorists and forced to land at the Entebbe Airport in Uganda. Additionally, he served as Chief of the General Staff of the IDF where he was involved in the negotiation and implementation of the 1994 peace treaty with Jordan – an especially meaningful event for Barak in light of his warm relationship with King Hussein. 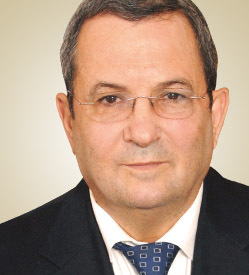 Prime Minister Barak also previously served his country as Minister of the Interior and Minister of Foreign Affairs. Mr. Barak received his Bachelors of Science in Mathematics and Physics from the Hebrew University in Jerusalem and his M.SC in Economic Engineering Systems at Stanford University in California.